Discrete and easy on the voice: the compact cardioid clip-on microphone in this system rejects noises coming from the side which means less risk of feedback. Without having to speak very loudly, the presenter’s voice is delivered in a rich and full manner. The bodypack transmitter features charging contacts for the optional rechargeable battery. Sync up the bodypack to the receiver wirelessly with the new wireless sync. 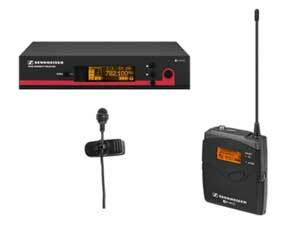 Lastly, the true diversity receiver provides for reliable signal transmission, even in large rooms.